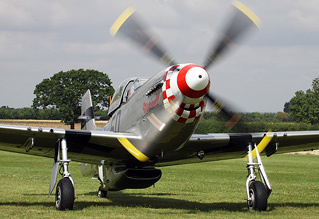 Holding its traditional slot in the calendar, the August bank holiday Sunday, this year marked the 20th anniversary of the Little Gransden Charity Air & Car Show. 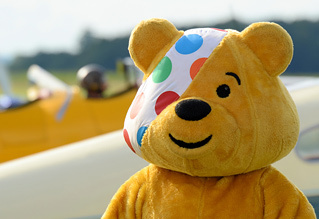 Since the first event was held the show has raised over £140,000 for the BBC's Children in Need and other local charities. Offering its usual mix of modern military aircraft, warbirds and aerobatic teams along with classic cars and relaxed atmosphere, this year's show produced a few noteworthy items. Stuart Norris reports from "The Farm". Photos by the author, Steve Buckby and Phil Whalley. On arriving this year the first thing that struck me was the weather. Mother Nature had not been kind to the show for the previous two years with spells of rain and strong winds so the sun was a most welcome sight, albeit ducking in and out of broken cloud! The flying display started with a Pawnee glider tug picking up, and flying a couple of circuits, with a banner thanking the crowd for their support over the last 20 years. This was followed by Vampire T11 WZ507. 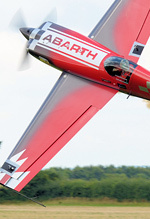 The aerobatics at the show this year were provided by the Trig Team flying their Pitts Specials, SWIP Team, Glider FX, Diana Britain in a Cap 232 and solo displays by an Extra 300 and Extra 330. Mark Jefferies flew the Extra 330 and prior to his display you could sense the anticipation and excitement building as he started his trade mark take off run, going straight into a dramatic topside pass as soon as the aircraft is airborne. If you haven't seen Mark display you don't know what you're missing! Classic aircraft included the beautiful Spartan pair which flew at the same time as a pair of Stearmans, the four Pratt and Whitney powered aircraft giving a wonderful sight and sound over the Cambridgeshire countryside. Other classic aircraft included a Miles Magister and Falcon, three Chipmunks from the "Red Sparrows" team and BAE's wonderful Avro Anson. 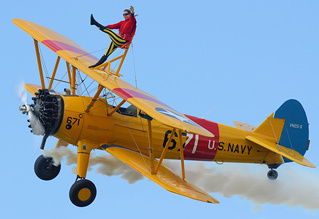 Captain Neville's Flying Circus entertained the crowd with their flour bombing, balloon popping and ribbon cutting routine, while Caf Hutchinson made her wing-walking debut on top of another Stearman. Modern day Royal Air Force participation came from the Tucano, in its smart Diamond Jubilee colour scheme, and the King Air. 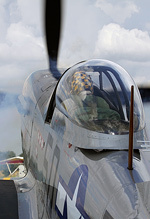 No show at Little Gransden would be complete without Maurice Hammond's pair of P-51D Mustangs, 'Janie' and 'Marinell'. This year, in addition to their familiar display routine, the Mustangs engaged in a mock dog fight with an Me108 that had been 'attacking' the airfield. Victory to the Mustangs was assured! Peter Teichman is another regular at Little Gransden and this year he bought along the P-40 Kittyhawk from his Hangar 11 Collection. Peter Holloway seemed to defy the laws of gravity, as always, in his Storch whilst the Bird Dog and Cub flew spirited displays. This year as well as the traditional memorial service, during which the crowd impeccably observed a minute's silence, the organisers paid tribute to Tracy Martin. Tracy was a long-time supporter of the show and is known for displaying her Bell 47. Sadly Tracy lost her battle with a brain tumour in October last year and the crowd gave a warm and heart felt round of applause when the Bell 47 completed its display. With a statement of intent that the show planned to mark its 20th year anniversary in style Dave Poile MBE, the shows main organiser, booked all three of the country's four engine bombers. Who'd have thought you would see the Lancaster, B-17 and Vulcan at Little Gransden in the same year?! The Lancaster and 'Sally B' both flew their usual displays with the pilots making use of the 'bend' to offer photographers the sought after topside passes. 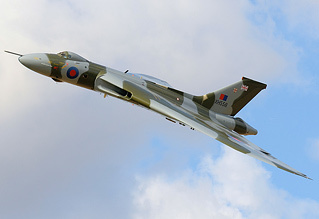 The highlight for many people though was the appearance of Vulcan XH558. Making two passes, the crowd were delighted, the second pass in particular drawing applause as Martin Withers dipped the wing to fly round the bend and then applying power on the climb out to produce the famous howl. 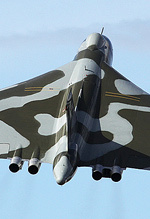 Seeing the Vulcan at a "small" show like this really did make a dramatic impact. 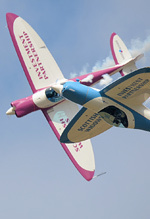 The show closed with Nigel Willson in his Yak 52 and Rob Davies in his Yak 11. The pair made a formation pass before breaking into their own displays. A great way to end a great day.